Super Hero Boy: The mickey mouse club! The Mickey Mouse Club might just be one of the longest running Disney shows though I can't say that for sure it was certainly one of those shows that I watched as a kid and my mom watched before me. It was a variety tv show that was popular during its original release in the 1950s. Hosted by an adult but most of the actors were children who danced, sang, did skits, pretty much all the things you'd expect of a variety program but with the stars being kids! Many kids today would associate the show with the fact that many stars were born on the set of Mickey Mouse Club including Britney Spears, Justin Timberlake, and Christinia Agularia. What they might not know is this is not a new phenomena as there have been several great stars born from the Mickey Mouse Club alumni. The first of which was Annette Funicello who was part of the original cast in the 1950s and went on to have a very impressive musical career and starred in quite a few big named films. I remember her from two Disney films including Shaggy Dog and Babes in Toyland. 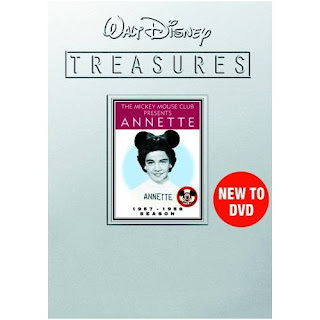 The new The Disney Treasure - Mickey Mouse Club Presents Annette is a collection of her past in the Mickey Mouse Club and includes 20 episodes that feature Annette and what made her really special. Though I have seen many of the vintage Mickey Mouse Club episodes it never dawned on me that the Annette in the Mickey Mouse Club was the same actor that later appeared in many of the older films I enjoy. I guess I just never thought about it. It was also tons of fun to see the classic Mickey Mouse Club episodes as I absolutely loved the Mickey Mouse Club when I was a little girl. Personally my favorite Annette episode is the 7th episode in the set "Paying the Piper" where the kids are playing spin the bottle. I find that incredibly entertaining as its just one of those games you talk about when your a kid but no one ever plays as everyone chickens out, at least all my friends did growing up. Though sadly no one is kissing in this episode it really gives you a little insight into kids in the 1950s and you get to hear Annette sing! Its a fun collection and a great addition for the Disney collector. The Disney Treasure - Mickey Mouse Club Presents Annette is available on Amazon right now!